One of our SSIS Package failed in Production today. By looking at the log information we got to know that the one of the Data Flow Task failed. We want to debug this package in Development environment but Package has other Tasks in it. How Can I only run the failed Data Flow Task? In SSIS Package you can disable the Tasks. Any Task or Container that you place in Control Flow Pane can be disabled and you can leave the Task or Tasks enable which one you want to run. This feature is very helpful while debugging package without deleting the Tasks. Once you are done with debugging , you can enable the Tasks. Tasks/Containers can be disabled. 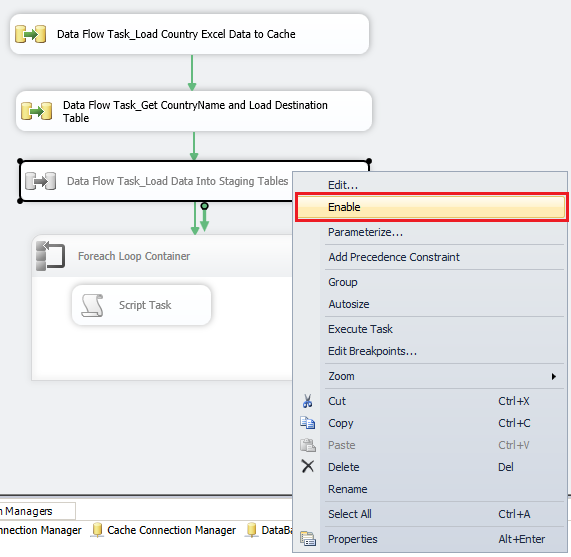 You can not go inside the Data Flow Task and disable a transformation or more than one Transformations. 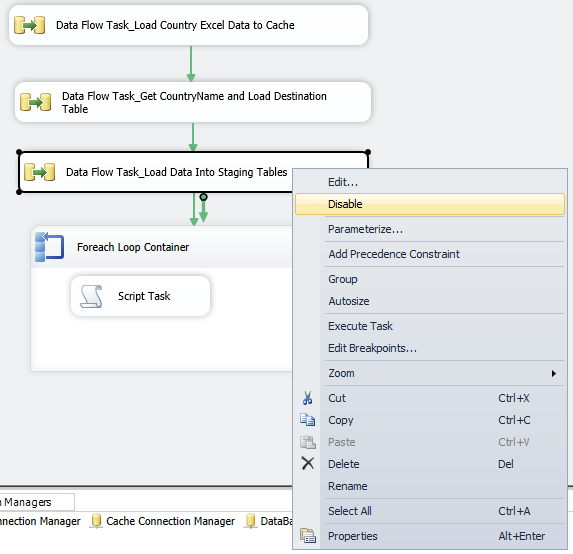 Let's say we want to debug above SSIS Package but we don't want to execute Foreach Loop Container and "Data Flow Task_Load data Into Staging Tables" Data Flow Task. We can simply Right Click on any of the Tasks/Containers and then click Disable.That will do the magic for us and disable the script. If you execute SSIS Package, the disabled Tasks will not run. To enable Task/ Container, Right Click on it and click Enable.